Laurel Electronics, Inc. designs and manufactures electronic instruments for industrial measurement, control and networking. Our programmable digital panel meters, electronic counters, digital controllers, transmitters, and large-digit displays set the standard of the industry with technical features and performance. 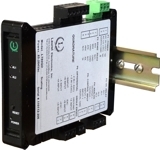 Our panel meters, electronic counters and transmitters can be networked via RS485, USB or Ethernet using the Modbus protocol. We also continue to support 4-20 mA current loops with new products such as our new serial-to-analog converter and isolating QLS quad loop splitter. Most of our products are designed and manufactured in our headquarters facility in Southern California. Laurel specializes in solving challenging industrial measurement and control problems. If it can be done with a programmable digital panel meter, controller, counter, timer or transmitter, chances are that Laurel will come up with a cost-effective solution -- so give us a call. Our products are sold and supported by qualified measurement and control systems distributors. We are looking for additional international distributors so that we can better serve global markets. Laurel Electronics was founded in 1990, but our engineering experience in industrial measurement and control goes back further. Our President and Founder, Barret B. Weekes, also founded Newport Electronics, Inc., where he served as chairman and president for 25 years. All Laureate digital panel meters, counters, remote displays and transmitters are ETL certified and have passed the same tests as for UL certification. They are also certified to meet European electromagnetic compliance specification EN 61010-1:1993. All Laureates bear the CE, RoHS, and ETL marks. Please click on the marks below for additional information.